The Awakening is upon Teresa Santiago. Despite training for this moment since she was a child, Teresa is unprepared for the vastness of her power or for her attraction to Rune, her Eternal protector and destined mate. United by purpose—and passion—Teresa and Rune must locate one of the missing artifacts before its power unleashes the forces of darkness on the world. His strength and her ability to summon lightning should be enough to protect them from the government agents charged with imprisoning witches. But their enemies are both mortal and magical—and danger follows Teresa at every turn. Gikany and Una jumped at the chance to read something different. 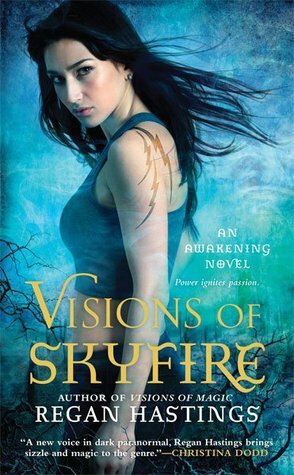 The world of witches described in Visions of Skyfire sounded really intriguing. We found this alternate urban fantasy compelling; the world and mythology is really interesting. However, we found the characters to be a bit…redundant and trite. Gikany read the first book, Visions of Magic, however, Una did not. That being said, Una did not feel as if anything was truly missing. She was able to immerse herself into the world easily; understanding the political atmosphere and the new world order. Gikany found that reading Visions of Magic allowed her to appreciate some of the finer nuances of the second book. She was able to understand the subplots that wove through this novel. The world is rich and interesting in this Awakening series, harking back to the long ago witch trials. In this world, magic has awakened and witch-hunts have once again begun, uniting to the world against a common foe, ironically enough. The story takes place against this backdrop. Our hero, Rune the Eternal, and heroine, Teresa, were paired by the Gods themselves, to bind themselves together and tasked with finding one of the pieces of a relic hidden to protect the world hundreds of years before. The original coven of witches created and used the relic in a ceremony, which ended in ruin nearly destroying the world. This is where the author lost us. Her attempts to illustrate the unimaginable betrayal Rune felt at the hands of Teresa’s previous incarnations and Teresa’s badly bruised heart from loving the wrong man became repetitive and annoying. Rune believed he was never going to trust her, and Teresa believed she was never going to love him, but they had no problem with performing a Mating Ritual that would bind them together for eternity. It got old. We feel it detracted a bit from the overall enjoyment of the world and the adventure. Even with this issue, we feel that Visions of Skyfire was a great adventure. We look forward to the next book in this exciting new Awakening series. Thanks for the review. The plot and world sound so great, but I like strong characters so I might avoid this one. Jay – it is a great world. Read the first book, Gikany said it was really good. The characters are strong…hence the redundancy of I won’t trust you but I’ll love you and I won’t love you, but I trust you with my life. However even with that thread…it’s not the meat of the novel…just a small annoyance. The overall novel is good. We have a snippet that’ll be posted soon of a “bad” character, can’t wait to see more of her!